You're a rich dude. You want the finer things in life. Not content with a Fitbit or even an Apple Watch, if it isn't designer and full of top spec tech, it just wont cut it. 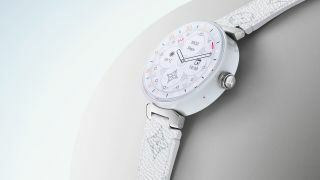 Money is no object and Louis Vuitton is here to serve again with another pricey smartwatch. The new LV Tambour Horizon, the follow up to the 2017 wearable of the same name, is again a Wear OS device aimed at the premium end of the market. Its headline new feature? The inclusion of the Snapdragon Wear 3100 chip. Designed in collaboration between Qualcomm and Google, it promises far superior battery life than that which has graced wrists before, with the Tambour Horizon boasting not only a full day's worth of power with its screen on, but an additional five in a low-power mode displaying simply just the time. Elsewhere, the Tambour Horizon has a higher definition screen than its predecessor and comes in a new white ceramic style to go with your LV handbag. In a tweak to the original design, the smartwatch also includes a 24 hour time ring that features a day and night indicator around its rim. You'll be able to use this even in ambient mode – the Wear 3100 new feature that keeps heart rate and step count on screen during the low-power state along with time. We're still waiting on pricing and availability for the Louis Vuitton Tambour Horizon, but with the original costing $2,490 / £1,960, don't expect this to come cheaply.